Historically the Rotary Club of Bluffton has received and granted funds periodically to nonprofit organizations that serve the Greater Bluffton community. In 2018, the Club's Board of Directors approved a more formal charitable giving process in hopes of making it beneficial and more fair to all concerned. Financial requests (for less than $500) and service requests (click to access the application) will be evaluated upon receipt. Larger financial requests will be evaluated quarterly, according to the schedule supplied in the grant application (click to access the application). If your organization would like to request a one-time grant of $500 or less, please email Past President Michael Putich. If you have questions about our Club's charitable giving process or requirements, please email Past President Michael Putich. All financial and service requests should be sent directly to Past President Michael Putich. Please do not forget to include the required attachments. 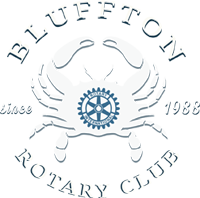 Thank you for your interest in partnering with the Rotary Club of Bluffton to accomplish great things in our community!